Following a difficult year of price negotiations and subdued volume growth, the technology industry finally witnessed revival this year. However, additional taxes on the back of expiry of tax exemption under STPI (software technology parks of India), has played a spoilsport for Infosys Technologies. During the financial year 2010 the firm paid a tax of about Rs 1,717 crore, up 91% from Rs 895 crore in the last financial year, the firm said in its annual report. 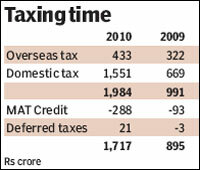 Its effective tax rate increased to 23.0% in FY10 as compared to 13.3% in FY09. "For the current year, around 13% of our revenue came from STP operations which are under tax holiday, 17% of revenue came from SEZ operations and 70% of our revenue are subject to full tax in India. We pay taxes in various countries in which we operate, on the income that is sourced to those countries," the report said. Around five units of Infosys located in Bangalore , Hinjawadi in Pune, Mysore, Hyderabad and Chandigarh under the STPI tax exemptions, came to an end in FY09. While STPI exemptions for Sholinganallur in Chennai, Konark in Bhubaneswar and Mangala in Mangalore ended in FY10. Infosys will now enjoy STPI benefits only for its Thiruvananthapuram unit. While tax benefits under SEZ will be applicable to its units in Chennai, Chandigarh, Mangalore, Pune and Thiruvananthapuram. The Section 10A of the Income Tax Act provides for 100% deduction for 10 years of export profits made by units set up in any STPI. This tax benefit is due to expire on March 31, 2011. SEZ, on the other hand, have 100% tax-holiday for the first five years and 50% for the next five years, and up to 50% for further five years. IT bodies were seeking at least two year extension of tax exemptions. However, the finance ministry is yet to take a decision on the extension.